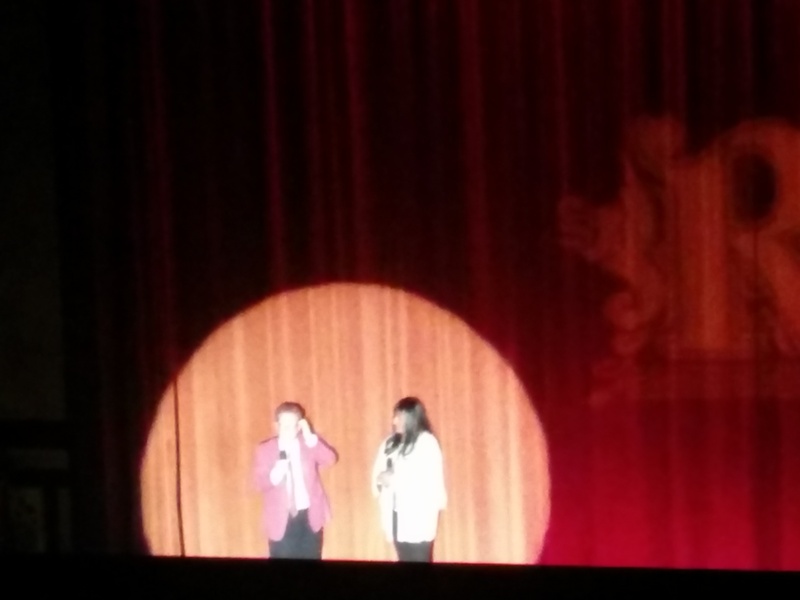 Last night I had the pleasure of attending the Redford Theatre‘s finale of its weekend tribute to actress Pam Grier. The theatre staff said this event had been “a year in the making”, arranging three separate screenings of (arguably) Grier’s most iconic films, Coffy, Foxy Brown and (the finale) Jackie Brown. Ms. Grier herself was on hand for the entire weekend, which also included a higher-priced dinner with her earlier on Saturday evening. I can’t think of a better bargain than the $6/per film ticket price at the Redford, though! The Redford rose to the occasion of glitzing out for the screening, with many unique souvenirs offered as one walked into the theatre and a long line in place an hour before the show to have an autograph and photo with Ms. Grier. It seems that the theatre does this type of event at least once or twice per year, and they eagerly mentioned plans to have Rita Moreno come to the theatre this fall for a similar event centered around screenings of West Side Story. Ms. Grier appeared at the opening and intermission of the film, expressing gratitude for Detroit’s role in her personal career history/trajectory (she attended her first film premiere of The Big Doll House here) and emphasizing an interesting and thoughtful point that she wouldn’t be where she is without the support of strong and supportive audiences. I feel like I don’t often hear actors of her stature turn it back to the fans like that, and this audience (myself included) clearly appreciated her honesty. She didn’t offer very many comments on the film at hand, Jackie Brown, aside from clear appreciation for Quentin Tarantino’s effort to write a film role especially for her, an interesting Method-actor type effort (that I would have liked to have heard a little more about) where she lived in her character’s apartment while the film was shooting, and a satisfied recollection of being able to point a gun at Samuel L. Jackson. But perhaps with her comments in mind, I felt that her satisfaction and pleasure in the role was more evident as I watched the film than how I had recalled it; I may have seen the film only once before. I should add that since the screening took place in Detroit, this film’s role as a movie adapted from an Elmore Leonard novel was explicitly noted. Pam Grier and Leonard had met on several occasions, not only while making the film, and she shared an amusing anecdote of waiting in line for a book signing he did (as a regular customer) until Leonard noticed she was there and called attention to “the star of one of my film adaptations” or something like that being right there in the bookstore. And finally the film itself. Weird to realize that the movie is now 16 years old, where I remember the long-building excitement of its role as Tarantino’s Pulp Fiction follow up, and a possible sense of commercial disappointment following its release on Christmas Day 1997. But time has been kind to the film, and it seems to have aged well, with only a few dated moments. Perhaps inevitably with what is now an older film, I found myself wondering “what the hell happened?/where are they now?” about most of the supporting cast, where Bridget Fonda abruptly left acting after 2002, Michael Keaton appears in films very rarely these days, and Robert DeNiro seems to (for the most part) value quantity over quality of roles. However Samuel L. Jackson and Robert Forster continue to be regular film presences. And Pam Grier herself is most likely somewhere in between, and her relaxed demeanor at last night’s event showed she’s most likely perfectly fine with that. Posted on February 23, 2014, in Movies. Bookmark the permalink. 2 Comments.